Riad Nashira & Spa brings a new dimension to hospitality in Marrakech, a concept that goes beyond other experiences. Riad Nashira & SPA inaugurates a new blend of style and values creating new sensations. A short walk to the major attractions of the city, among which Medersa Ben Youssef, the Marrakech Museum, the Souk and the famous Jemaa el-Fnaa Square: Riad Nashira & Spa is part of the open-air museum of the Medina, where with every glance you can enjoy intricate alleyways, monumental fountains, the city’s mosques and traditions, in close contact with the rhythms and customs of its inhabitants. 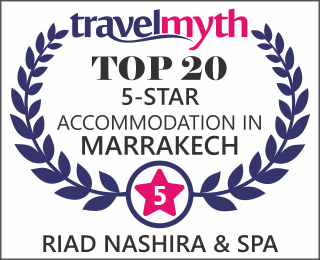 Riad Nashira & Spa has 16 rooms, a sun terrace, indoor and outdoor pools and a fine restaurant. In the Spa you can enjoy our traditional hammams, massages and a Jacuzzi, let yourself be pampered by the expert hands of our masseuses and our natural beauty products, all from the region of Marrakech. Our culinary offering, from early morning breakfasts to the elegant evening dinners, perhaps under a starry sky, is wide and varied and offers fresh, wholesome foods prepared onsite by our chef and his team. Riad Nashira & Spa wants to make you feel at home: its staff is at your full disposal and all of the Spa services have been organized so that you can make the most of your stay in Marrakech.